Apart from the traditional occupational diseases resulting from work related toxic exposures (e. g., pneumoconiosis, dermatitis, and cancers), noncommunicable diseases (NCDs) like diabetes, hypertension, cardiovascular diseases, mental health, substance use, and other lifestyle disorders are increasingly observed among industrial workers, thus posing a dual burden. This epidemiological shift in morbidity patterns in occupational environments may be attributed to changing nature and complexities of work environments, altered lifestyles, work stress, increased travel, and psychosocial factors. The prevalence of common mental disorders (CMDs) in India is around 20-30 per 1,000 population. The extent of the problem in general community is fairly known, but evidence regarding their magnitude, distribution, and determinants in industries remains less understood in Indian settings, in spite of the huge workforce. Available evidence shows that the prevalence rates of psychiatric morbidity in the Indian industrial population range from 14 to 37%; ,, whereas, the point prevalence of psychiatric disorders in the general population in India varies from 0.95 to 13%. , This crudely indicates that the rates of psychiatric morbidity in the industrial workforce maybe higher than that of the general population. Given the huge size of the workforce (nearly 30-40% of population), the absolute number of workers expected to be affected with NCDs and neuropsychiatric disorders will be substantial and will place immense burden on industrial health systems to address the same. Screening and timely management of these disorders in industries will lead to significant health and economic benefits. Currently, a system to screen for the above is still evolving in the industries, due to lack of prioritization, regulatory requirements, and standardized guidelines both for identification and reporting of NCDs and psychological disorders. This calls for a need to establish model screening systems for NCDs and mental disorders within the industrial health systems and further initiate their effective management. This is expected to improve work productivity, reduce work stress, reduce long-term cost of care, sickness absenteeism, and improve the overall psychosocial environment in industries. This article presents the initial experiences of Centre for Public Health, NIMHANS and Toyota-Kirloskar Motor Private limited to integrate screening for common mental health problems, stress, and select NCD risk factors within the periodical medical examination system. It is believed that this initiative will yield regular information on the quantum of the problem and also help in planning workplace interventions to address the same. To identify proportion of employees with NCD risk factors and symptoms suggestive of mental health problems (psychological distress, depression, anxiety, stress, and alcohol and tobacco use). As per the Indian Factories Act, industries employing more than 200 workers are to have an occupational health center, a factory medical officer for upto 500 workers and one more medical officer for every additional 1,000 workers and conduct periodic and pre-placement health examination. The occupational health unit of Toyota-Kirloskar Motor Private Limited, Bidadi conducts annual medical examination for all its employees (approximately 7,000). The examination schema consists of multiple examination stations (general medical check-up, ophthalmic evaluation, audiometry, and laboratory) and each employee passes from one station to another for completing the assessments. Assessment of mental health and select NCD risk factors was integrated into this schema. Informed consent for this exercise was obtained after explaining the purpose to the management and verbally to the employees. Each employee was handed over a screening questionnaire upon entry into the examination room, with clear instructions not to discuss with one another for filling the forms. The bilingual (Kannada and English) questionnaire consisted of self-report and interviewer-administered sections, presented in an easy to understand language style. It was subjected to pretesting, translation, and back translation before use. The self-report section of questionnaire elicited information on age, gender, designation, years of work experience, weight, height (checked as part of medical examination), alcohol and tobacco use, stress, physical activity, diet, family history of mental illness, and select NCDs and sickness absenteeism. The interviewer-administered section consisted of items to screen for symptoms suggestive of psychological distress, anxiety, depression, and suicidal ideation. Employees were asked to complete the self-report section of the questionnaire in waiting period between examination stations. Questions left unanswered and mental health section of screener questionnaire was administered by a trained investigator at the end in a separate station. Participation of workers in the screening was purely voluntary and we expected to cover atleast 10% of workforce (700 workers) over a 2-month period (June-July 2013). The questionnaire used in the assessment included items from WHO-STEPS  instrument to enquire about alcohol and tobacco use (modified suitably to identify users (past 1month), duration of use, and quantum of use) and physical activity (any vigorous-intensity sports, fitness, or recreational (leisure) activities that cause large increases in breathing or heart rate like running or football for at least 10 min continuously). A single item for screening for stress (3 point response "if they perceived stress due to work": Yes-regularly, Yes-sometimes, and No), was followed by another item to enquire whether 'they are experiencing health problems due to work stress'. This was used for rapid screening for work stress. The feasibility of this integration of this screener in the annual medical examination process was assessed in terms of acceptability (proportion of workers declining to participate), smoothness of implementation (subjective perception of the health personnel on whether the integration disturbs the process of annual medical check-up), costs involved, and type of results generated. Data was entered and analyzed using Epi-info. Workers screened positive for various risk factors and disorders were presented as frequency and percentages. Chi-square was used to test for associations/trend between positive screeners and other categorical variables. Around 706 (10% of regular workers) who appeared for annual medical examination also underwent questionnaire-based screening for psychological distress, depressive and anxiety symptoms, alcohol use, tobacco use, risk factors like obesity, and lack of physical activity. The sociodemographic details of workers are presented in [Table 1]. Study subjects were predominantly youth (mean age 27 years) with average work experience of 3 years and 4 months. Nearly 40% had work experience more than 5 years. The proportion of current tobacco users (last 30 days duration) was 18% (124), with median 60 months duration of use. The proportion of alcohol users was 57.5% and median duration of use reported is 4 years [[Table 2]]. Nearly 305 (43%) workers reported that they indulge in physical activities apart from their work. The proportion of workers who were overweight and obese was observed to be 22.1 and 2.3%, respectively, which was higher than estimated prevalence for overweight and obesity for general population in India (11 and 1.9%, respectively; 2010). Studies among industrial workers in Delhi revealed that prevalence of obesity was 18.9%. Work stress is the response of the body, mind, and behavior as a result of encountering stressors, interpreting these, making judgments about controlling or influencing the outcomes of these events. Around 10% of workers reported work stress on a regular basis. Tobacco use, alcohol use, overweight, and stress are common risk factors for diabetes, hypertension, cardiovascular diseases, stroke, cancer, and mental health problems. Around 275 (38.9%) employees had atleast one of the following four important risk factors mentioned above and 133 (18%) workers had two risk factors [[Table 3]]. 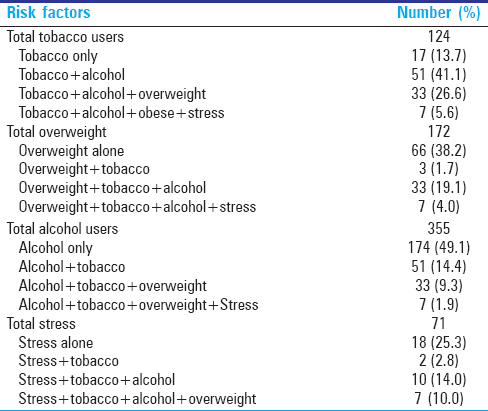 Alcohol use was the predominant exclusive single risk factor among the workers followed by being overweight for age. Exclusive and dual risk factor stratification among the workers screened along with risk factor combinations is depicted in [Table 3] and [Table 4] respectively. It is observed that 51 (9.7%) workers use both alcohol and tobacco and similar proportion are both overweight and use alcohol. These observations imply measures aimed at risk factor reduction among workers to be initially targeted among those employees reporting consumption of alcohol, as stress, overweight, and tobacco use are also commonly observed in them. CMDs are disorders that are commonly encountered in community and specific psychiatric syndromes incorporated in the concept of CMDs include depressive and anxiety disorders. Assessment revealed that 22% of workers screened positive for psychological distress. The proportion of workers with probable mild anxiety disorders is 181 (25.6%), moderate (6.5%), and severe (1.3%) (1.3%) [[Table 5]]. Proportion of workers with psychological distress in the industry is of sufficient magnitude that needs further detailed accurate assessments to ascertain the same [Table 6]. It was observed that among workers with 3-4 years of experience, around 35-38% reported psychological distress or anxiety. The same was observed to be around 40-45% among workers having work experience more than 5 years, though the trend was not statistically significant. However, it crudely indicates the risk period for prioritization in planning stress reduction programs. Acceptability to the assessment was good as refusal to participate was less than 2% (10 workers). By adopting a mixed method of self-report and interviewer-administered technique, we observed that each worker spent a maximum of 5 min in the station set-up for mental health screening, which would have taken another additional 10 min, if the entire questionnaire was interview-administered. This is important given the fact that a car is manufactured every 5 min in the assembly line and workers presence is important. Expenses involved in this exercise were limited to printing of two-page questionnaires (1 Indian rupee per worker), minimum logistics arrangement and lack of trained/dedicated person to administer the same. The in-house allied health staff in the occupational health unit can be trained to conduct the same for sustainability of the endeavor and there is scope for converting the entire process into a digital format and also may be used in out patient department (OPD) of occupational health clinic. There is potential for maintaining a record of mental health status, alcohol and tobacco use data along with other medical data for the purpose of education, research, service, and training. It would also make the annual medical assessments more comprehensive. Based on preliminary crude observations, we feel that there exists promising feasibility quotient for integrating screening for mental health in the annual medical examination using a mixed methodology approach of self-report and interviewer-administered technique. This initiative is based on the premise that periodical medical examinations in industries provide a missed opportunity for integrating mental health and substance use screening and time spent in waiting in-between two health examination stations time can be effectively utilized to self-fill out the questionnaire by the workers, followed by a last station specific for completing mental health screening questionnaire. This would make the periodic medical examination more comprehensive and provide opportunities for comparing mental health status with other biological and physical parameters assessed routinely. Our experience shows that it is potentially feasible to integrate screening for mental health, work stress, and NCD risk factors, during annual medical examination of workers by incorporating a combination of self-report and interviewer-administered technique. The above statement may be viewed with a limitation that a comparative analytical epidemiological methodology was not adopted, as it was a feasibility exercise. The population prevalence of overall tobacco use among males is 48% and that among females is 20% (Global Adult Tobacco Survey). Meta-analysis of various Indian studies indicate that the prevalence of smoking in India is 28.5% (men) and 2.1% (women) with median prevalence of 30.6%. Available evidence indicates that the prevalence of smoking in industrial workers ranges from 30 to 52%. The proportion of workers reporting tobacco use is comparatively lesser in this assessment (18%); nevertheless there is a need for further reduction considering their synergistic interaction with other risk factors for NCDs. The proportion of alcohol users is relatively higher (10 times higher) as compared to the general population prevalence rates for alcohol use (alcohol use is 60 per 1,000 population and alcohol dependence is 10 per 1,000 population). Underreporting and volunteer bias in current assessment is also a possibility. 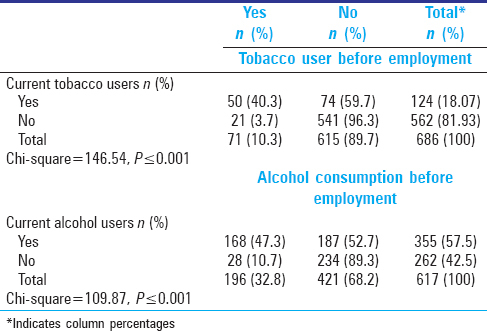 Nearly 59% of the tobacco users and 53% of alcohol users reported that they were not using the same before employment in the current job, indicating a possible behavior change after employment. Rise in income, freedom, living away from parents, enhanced interaction with friends, and stress buster outings may have facilitated this behavioral change. 'Employment' per se, especially among youth, is an important interface for piloting interventions to prevent alcohol and tobacco use, which may help in delaying the initiation and reducing the severity of use. Around 10% of workers affirmatively reported experiencing stress due to work regularly, whereas, 60% reported experiencing work stress sometimes. Nearly 11% of workers perceived that they are experiencing health problems due to stress. Some degree of misclassification may be expected among the 428 (60%) workers who reported that they experienced work stress sometimes, indicating a need for conducting more detailed stress evaluation. Studies done on industrial workers vide Occupational Stress Index scale revealed that nearly 25.1% experienced moderate to severe stress. Eustress being necessary for performance, it is still not clear on what constitutes acceptable levels of stress, beyond which eustress turns into distress. Evidence on magnitude of CMDs and psychological distress among Indian employees in automobile industries is lacking. Among other workers, the prevalence of psychological distress is as follows: iron ore industrial workers (36.2%)  ,Police (35.3%),  petroleum off shore workers (9%),  and worker in chemical fertilizer plant (51%). There is wide variability owing to differences in study setting, sample size, assessment modalities, and study instrument used. Collectively around 22-30% of workers screened responded affirmatively to questions directed to ascertain probable symptoms of psychological distress, anxiety, and depression; indicating a need for confirmatory assessments. Nevertheless it is an indication that psychological hazards may be prevailing in the industry, in a sublime manner. An assessment of job control, role conflict, work-reward imbalance, and work-life balance needs to be better understood to search for predisposing factors. Attribution of the psychological symptoms among workers to workplace environment-related factors, needs to be exercised with caution, as these problems are multidimensional. A random representative sample of workers was not studied, as our primary focus was to assess feasibility of the screening approach for system development activities in future. Results may be affected to some extent by healthy worker effect, but almost all workers who were scheduled for annual medical examination process also attended the mental health screening. Assuming representativeness, we would expect 1,260 workers with tobacco use; 3,990 workers with alcohol use; 700 with work stress; 210 with obesity; and 1,610 with psychological distress, in contrast to minimal notification of classical occupational diseases in the industry. The purpose of periodic health examinations is to identify various diseases/risk factors at an early stage and initiate management. Unfortunately, annual medical examination systems have not been updated to meet the challenge of changing disease epidemiology in many workplaces. Though being commonly observed, the above new health problems are neither subjected to notification nor surveillance by Indian Factories Act, thus limiting their priority from industrial health managements. The National Mental Health Programme strongly advocates the need to address the mental health of workers in various occupations, but little has happened in ground level. A intersectoral coordination between ministries of health and labor are required to align national health priorities and programs in workplaces also. Based on our observations, we recommend that screening for mental health and risk factors for NCDs be integrated in the periodic health examination system in the industry and urge the industry management to set up a multidisciplinary committee to oversee the implementation of occupational mental health and health promotion program. As a start-up, we even conducted a stress management sensitization training, for managers to catalyze their involvement to take things forward. NCDs including mental health disorders are not directly caused from exposures in work environments, unlike classical occupational diseases like silicosis, bysinosis, etc., However in terms of magnitude and burden, they are commonly observed and expected to contribute to significant and recurrent healthcare costs. It is time to initiate systems for screening for NCDs including mental health disorders in industries and create enabling environments for their better management. We sincerely acknowledge Director and Vice Chancellor, NIMHANS and Senior Management of TKMPL-Bidadi for their support in the programme. Mr Sangappa and Mr Saijan Cyriac, Field Information Officers, Department of Epidemiology, NIMHANS and Ms Deepashree, Data Manager, Department of Epidemiology, NIMHANS. Staff from Occupational Health Centre-TKM-Bidadi, Dr Manjula, Associate Professor, Department of Clinical Psychology, NIMHANS and Faculty, Department of Epidemiology, Centre for Public Health, NIMHANS. 1. Government of India Economic survey report. Employment in organized sectors in India-Public and private. A52. Statistical appendix. 2011-12. Available from: http://www.indiabudget.nic.in/survey.aspv [Last accessed on 2013 May 10]. Directorate General, Factory Advice and Labour Institutes (DGFASLI). Statistics on Status of compliance with statutory provisions based on data collected by DGFASLI. 2009. Available from: http://www.dgfasli.nic.in/info1.htm [Last accessed on 2013 Mar 09]. Gururaj G, Girish N, Isaac MK. Mental, neurological and substance abuse disorders: Strategies towards a systems approach. National Commission on Macroeconomics and Health Background papers: Burden of Disease in India. Ministry of Health and Family Welfare Government of India; 2005. p. 226. Ganguli HC. 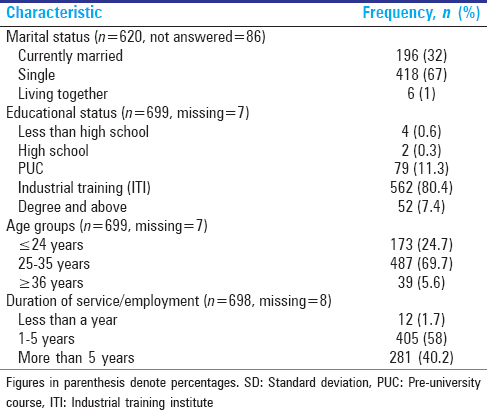 Prevalence of psychological disorders in an Indian industrial population-Part I. Indian J Med Res 1968;56:754-60. Bhaskaran K, Seth RC, Yadav SN. Migration and mental ill health in industry. Indian J Psychiatry 1970;12:102-16. Kar N, Dutta S, Patnaik S. Mental health in an Indian industrial population: Screening for psychiatric symptoms. Indian J Occup Environ Med 2002;6:86-8. Reddy VM, Chandrashekar CR. Prevalence of mental and behavioural disorders in India: A meta-analysis. Indian J Psychiatry 1998;40:149-57. World health organization. The WHO STEP wise approach to chronic disease risk factor surveillance (STEPS) WHO STEP wise approach surveillance- Instrument v. 3.0. Available from: http://www.who.int/chp/steps/STEPS_Instrument_v2.1.pdf [Last accessed on 2013 May 05]. Shamsunder C, Sriram TG, Murali Raj SG, Hanmugham V. Validity of a short 5-Item version of the general health questionnaire (g. h q). Indian J Psychiatry 1986;28:217-9. Kroenke K, Spitzer RL, Williams JB. The patient health questionnaire-2: Validity of a two-item depression screener. Med Care 2003;41:1284-92. Patient Health Questionnaire screeners Instruction Manual. Instructions for Patient Health Questionnaire (PHQ) and GAD-7 measures. Available from: http://www.phqscreeners.com/instructions/instructions.pdf [Last accessed on 2013 Mar 06]. World Health organization. NCDs country profile. India. 2010, Available from: http://www.who.int/nmh/countries/ind_en.pdf [Last accessed on 2013 Mar 06]. Kishore J, Kohli C, Sharma PK, Sharma E. Noncommunicable disease risk profile of factory workers in Delhi. Indian J Occup Environ Med 2012;16:137-41. Ramos JA, Sharma M. Practical Stress Management. Pearson Education Benjamin Cummings Publishers; 2007. p. 4. Jhanjee S. Tobacco control in India- Where are we now? Delhi Psychiatry J 2011;14:27-32. Jindal SK, Aggarwal AN, Chaudhry K, Chhabra SK, D'Souza GA, Gupta D, et al., Asthma Epidemiology Study Group. Tobacco smoking in India: Prevalence, quit-rates and respiratory morbidity. Indian J Chest Dis Allied Sci 2006;48:37-42. Murthy P, Sankaran L. Workplace wellbeing. Integrating psychosocial issues with health. NIMHANS 2009. Kiran Kumar PK, Jayaprakash K, Monteiro FN, Bhagavath P. Psychiatric morbidity in industrial workers of south India. J Clin Diagn Res 2011;5:921-5. Kaur R, Chodagiri VK, Reddi NK. A psychological study of stress, personality and coping in police personnel. Indian J Psychol Med 2013;35:141-7. Nielsen MB, Tvedt SD, Matthiesen SB. Prevalence and occupational predictors of psychological distress in the offshore petroleum industry: A prospective study. Int Arch Occup Environ Health 2013;86:875-85.